In celebration of 115 day, Zombies Director Jason Blundell answers players questions on Twitter. Zombies lore truly begin with the introduction of Element 115 in Shi no Numa back in 2009. Since then, the number 115 has held a special place in Zombies players hearts. January 15th, shortened to 1/15 in the United States, is today and to celebrate, the elusive Black Ops 4 Zombies Director, Jason Blundell, is answering questions on Twitter. Something similar to Newtons Cookbook from Black Ops 3 will be coming to Black Ops 4. Jason clarifies that this will allow you to combine your elixirs together to make new ones. This falls in line with the recent news that a new perk will be coming to Zombies soon and how Treyarch brought back Speed Cola as a perk modifier in a recent update. When asked about a tease for DLC 2, Jason responds with “it’s all Greek to me” possibly hinting at a Greece/Zeus related map. This means that DLC 2 is most likely a Chaos story map, continuing the trend of each map representing a God. Voyage of Despair represented Odin, Dead of the Night was tied to Danu, and IX is presumably the Ra map, making the next Zombies map tied to Zeus.
.@MrTacoBelmonto asks "What are the team’s thoughts on the current Perk balance in the game?"
. @EdFiftyNine_ asks "Although you probably can’t give us a number can we expect more zombie maps than usual for a Black Ops game?" 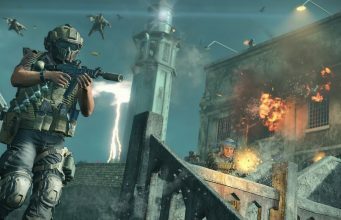 Here, Blundell reiterates Call of Duty’s original promise that Black Ops 4 will have more maps than any other Black Ops game in the past. No exact number was specified. One more from @EdFiftyNine_: "Which Zombies Character would you want to go for a pint with?" Of all the Zombies characters introduced in the past decade, Jason would choose Stanton Shaw from the Chaos crew to grab a drink with. Shaw has been depicted as a heavy drinker since his inclusion in Black Ops 4 and further shown in the Call of Duty Zombies second comic series. Giving more details on the Server Pause feature coming to Zombies later this year, Jason specifies that only hosts in private matches can pause. You won’t be able to pause in a public match. The HUD (heads up display) in Black Ops 4 Zombies has been something fans have had ire with, however there are no current plans to make any changes.
.@RichKillerTsm asks, "What is your favorite unsolved zombies cipher, which game/map is it from?" Keeping it very close to the chest, Jason avoids giving any specific details about upcoming weapons aside from the previously announced MP 40 and Grav that are making their way over from Blackout to Zombies. Once again, more reiteration of information released in today’s 115 blog post. All camos will make their way to Zombies this year, and there will be more customization coming with no further details.
.@Sif_san_ asks: "Why did Dead of the Night come out after IX instead of the other way around? Why flip the chronology like that?" Jumping back to the maps themselves, Jason answers a question about the order of when the maps came out. He explains why Dead of the Night released after IX even though it takes place before it chronologically. The first reason is because of scheduling with the celebrity cast for Dead of the Night. While the other reason is that the development team wanted to introduce certain concepts and ideas in IX and Voyage of Despair in order to ease players into Black Ops 4 Zombies before throwing them into Dead of the Night.
.@dylan_ebin asks "Is Scarlett Shaw's father?" Answering a sort of weird one, Jason confirms that Scarlett is NOT Shaw’s father. However, Alister is Scarlett’s father and that backstory is explored in the comic series. Popular Zombies Youtuber, MrDalekJD, gets his question read. When asked about a roadmap for Zombies content, Jason linked him back to today’s 115 blog where Treyarch gave a broad overview on what to expect in Zombies throughout the year.
.@Massimene14 has a question for Jason Blundell: "what’s your guilty pleasure??" 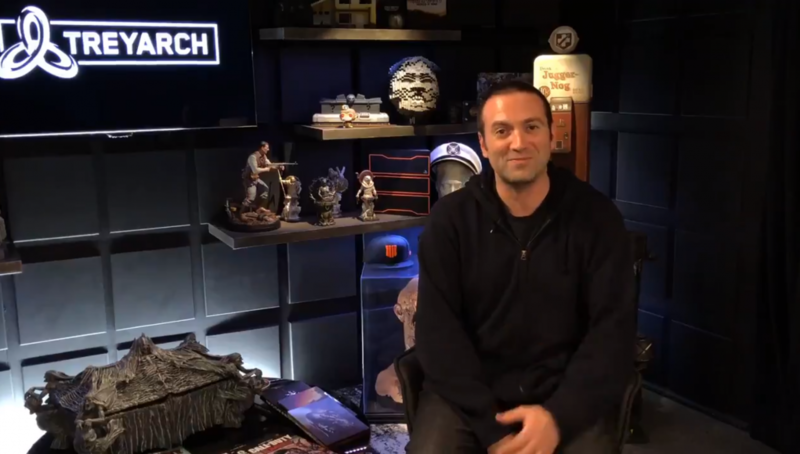 Fun fact: Jason Blundell’s guilty pleasure is consuming human flesh on the weekends. And with that send off, the Q&A has concluded. Be sure to check back on charlieintel.com when all these new Zombies features make there way to Black Ops 4.